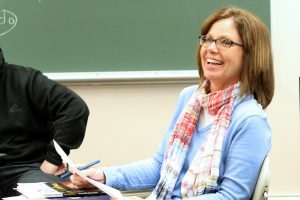 Late last spring Richard Paige interviewed Associate Professor Michele Pittard, this year’s winner of the College’s highest honor for faculty—the McLain-McTurnan-Arnold Excellence in Teaching Award. You were an English major in college. Where did the love of the written word come from for you? Pittard: I was always a reader as a kid, but also a writer. I kept a journal from a very early time in my life, and so, I think it came partially from my mom, who was also a reader. My grandmother on my dad’s side was a kindergarten teacher and I can remember reading with her. But writing has always been a part of my life. Personal journaling—and I’m a big letter writer too. I still like to write letters to people. What do you think makes the liberal arts a good way for students to prepare to be teachers? A teacher, no matter what your discipline is, benefits from the understanding and appreciation of other disciplines and seeing the connections between them. But it’s also the skills that come along with a liberal arts education. I want teachers to be able to problem-solve in the classroom. They have to be able to think critically about their students’ needs, and they also need to be open to the diversity that they will see in whatever school they end up in. I think all those things are nurtured and facilitated in the liberal arts setting. What do you think are the essential characteristics of a good teacher? I think people have to really love—they have to have a passion for something. It either has to be a passion for making an impact on young people or a passion for the content. Teaching is too hard at any level and too important at any level to go into it without that passion. You need to be in a stance of caring. Just caring about your students, caring enough to be prepared, caring enough to design lessons and activities and assignments that are relevant to them and will help them grow. One of the biggest surprises our students encounter in the teaching experience is how difficult this is. When you’re a student in a class and you have a good teacher in front of you, it just looks so easy. In the Education minor and in the certification program, we sort of take students behind the scenes to see the work. And then they realize this really is difficult. What one piece of advice would you give beginning teachers? I tell my students that you have to make a human connection with your students. Building that rapport with them, building that relationship with your students, is the first thing. From there, everything else becomes a lot easier. You have taught some fascinating freshman tutorials: Dean Scott Feller has praised you for your commitment to our all-college courses, your work on the Enduring Questions course. Teaching freshmen is a real gift, because sometimes you end up having those same freshmen as seniors in a course, and that’s so cool. You forget about how much students develop from freshman year to senior year. I know you enjoy working on your golf game, and you write young adult novels, among other things. What do you enjoy about the writing process that you don’t get anywhere else? Oh, it’s surprising. You can go into a writing project, whether it’s a novel or a paper or a letter, with an idea of what you want to say and what the story is and where you want to go, but the writing process itself is so generative and it spawns things that you just can’t imagine happening. And if you can be comfortable with that ambiguity and that process, it can lead you. You let the writing take you where it’s going to go. If you can allow yourself to get immersed in that, it’s surprising. Listen to the entire interview at Wabash On My Mind on the Wabash Web site.